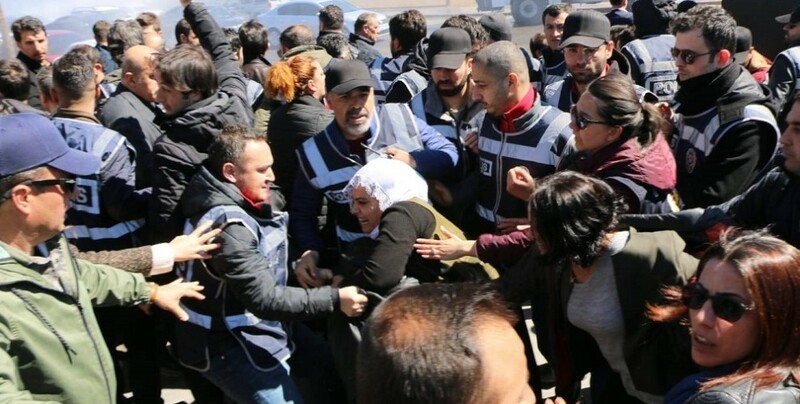 The police attacked the people who were visiting the grave of Zulkuf Gezen, who carried out a sacrifice action in Tekirdag Type F Prison No.2 to protest the isolation imposed upon Ocalan. The police attacked the crowd of people who were going to the Yenikoy Cemetery to visit the grave of Zulkuf Gezen, who carried out a sacrifice action in Tekirdag Type F Prison No.2 to protest the isolation imposed upon Kurdish Peoples’ Leader Abdullah Ocalan and whose body was stolen away to be buried in a rush. The crowd, which included Peoples’ Democratic Party (HDP) Co-chair Sezai Temelli, Democratic Regions Party (DBP) Co-chair Mehmet Arslan and regional MPs from the party, were cut off by the cemetery gates. The police set up barricades with shields and armored vehicles by the entrance and attacked the crowd with water cannons. Following a long struggle between the police and the MPs, the MPs crossed the barricade. They were circled by the police once again inside the cemetery and were not allowed to go to the grave. The MPs went to the Saklat Mourning House to offer condolences to the Gezen family.